Fifty years of occupation. Colonizing a neighbor instead of another continent doesn’t make it all right. Having an empire now instead of two hundred years ago doesn’t make it all right. Fifty years of non-violent resistance. The powers-that-be insist that’s the right thing to do. Then they ignore the hell out of anyone who actually does it because quiet people aren’t a problem. Don’t ask why there’s so much death and destruction in the world. Ask why there isn’t more. I have a hard time even writing about the news from Tibet. To many people in the US it’s some faraway place which is the pet project of a few effete actors. It is way more than that. It is unique in the world, but not because it’s beautiful. Most of the planet is beautiful. It’s culturally extraordinary, but that’s not unique either. 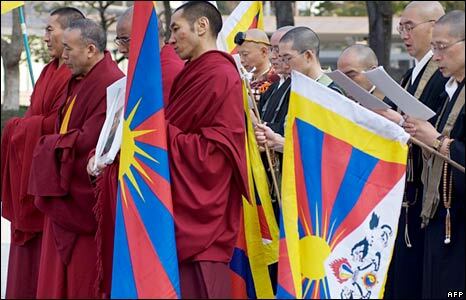 Tibet has become a test for the world because of who the rest of the world is. You are currently browsing the archives for the Tibet category.